⬅ VBS Fridays: Read. Reflect. Pray. She was not expecting to meet Him there. She was hoping not to meet anyone at all. That’s why she had come to the well in the heat of the day — when all of the gossipy, grownup mean girls would be gone. He asked her for a drink. And then He offered her “a spring of water welling up to eternal life.” He spoke truth that convicted her, right to the very core of her being. She couldn’t handle it. So she changed the subject. He chose to share it with her. I also can’t help but wonder how often Jesus comes to me — and I don’t recognize Him. I’m too busy or distracted, not really paying attention… or so focused on my pain, my guilt and shame, that I don’t see Him reaching out to me with love and mercy and grace. I KNOW there are times when He wants to shine the light of His truth into the dark corners of my heart… only I don’t want to go there. I’m not sure I can handle it. So I try to change the subject. I find myself wanting to be a better woman. The woman He created me to be. And I return again to sit at His feet. I don’t want to miss anything He wants to reveal to me. 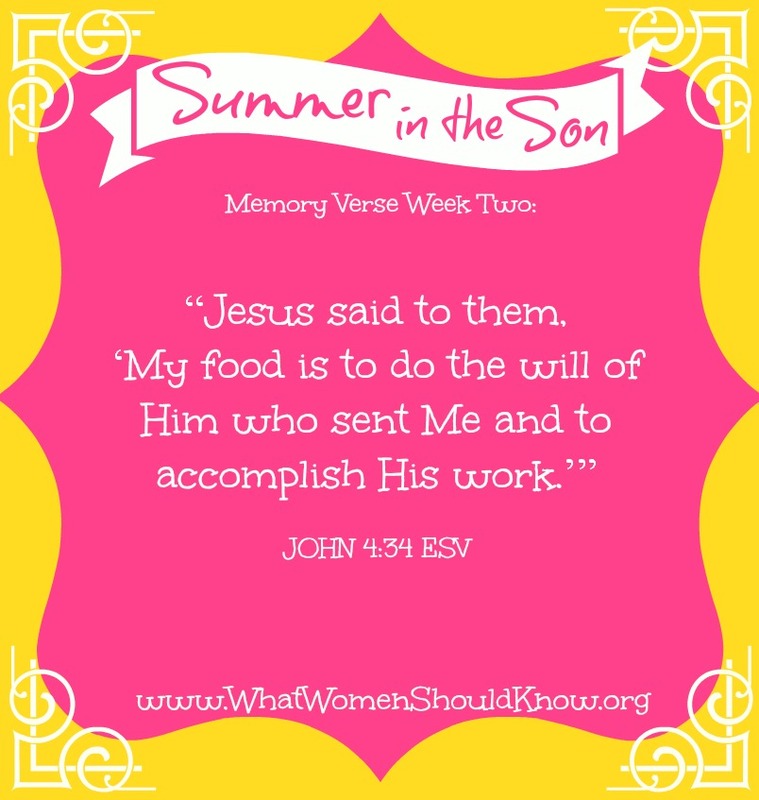 Don’t forget you can download the free printable memory verse cards here. You’ll also find more goodies on Pinterest and Facebook! Today’s question: If we’ve tasted the Living Water that Jesus said would quench our thirst, why do we sometimes find that we’re still thirsty… even parched?